Artist and nutritionist Rasha Tayeh presents a dinner party like no other on Friday 28 April. In collaboration with chef Shu Liu (Shu Restaurant, Collingwood) the dinner traces the Silk Road, using spices and herbs that mark points along the journey of these ancient trade routes. A multi-lingual performance, installation, and feast for the senses for a limited group of just 20 guests. The Silk Road and other trade routes are an insight into the way we eat today. 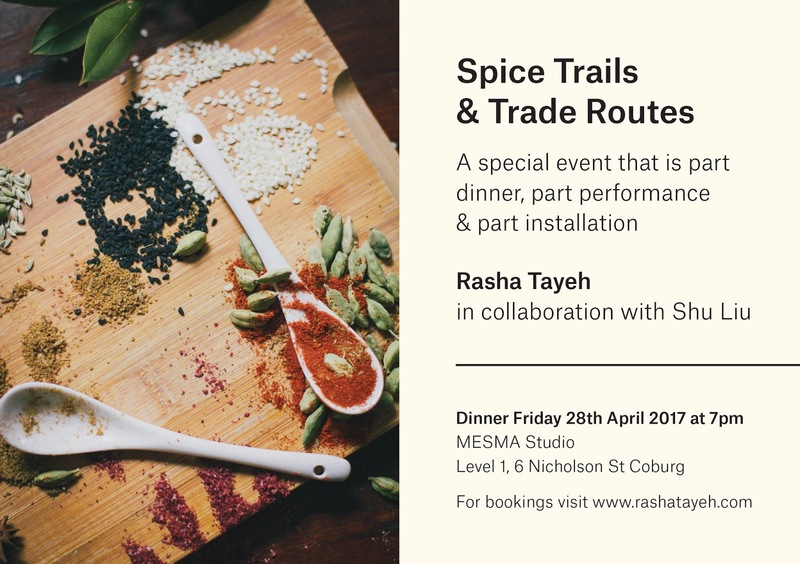 This dinner-performance-installation explores some of the incredible stories of spice merchants and traders who took these journeys, and celebrates the spices and flavours they traded. In this event we’ll be tracing culinary history through our senses, merging art and food in experiential and performative ways. Rasha Tayeh is a Palestinian artist based in Melbourne; her work crosses a range of photography, film, sound and installation practices. She is also a nutritionist and researcher interested in food history, food anthropology, and the space where art and health intersect. Rasha’s work draws on themes around phenomenology, identity, feminist issues, spirituality and humans’ place in society and their natural environment. MESMA Studio is a coworking and multimedia arts space in Coburg that aims to create an open and collaborative environment for creative enterprises from all disciplines, and function as a community hub that enlivens and inspires artists and small businesses in the Brunswick and Coburg area.